I didn’t expect The Marbury Lens to grip me so tightly and to hold on so hard afterward. This book is haunting and haunted: filled with sad, strange, unforgettable scenes, and characters you want to pluck from the horror and wreathe in kindness. It’s ostensibly about two worlds, our contemporary one, and Marbury (a fantasy/dystopian landscape of unspeakable terror–and also tender heroics). Marbury is seen and experienced only through glasses a stranger (in a sense) leaves for Jack. Yet there are character and situation crossovers that bring the worlds uncomfortably close, until the reader isn’t sure what place is the most real—or the most dangerous. Smith’s writing is raw and immediate, and spares his readers nothing. Where terror is, there the reader is also. Where beauty and altruism blooms, we see and taste it. And as Jack begins his descent into obsession with the life inside Marbury, we experience the same madness. Several times while reading the book, I had to put it down and just breathe. Orient myself back into my own skin. Smith’s worlds–the contemporary, Marbury, and also the one inside Jack’s mind–are truly that primal and powerful. 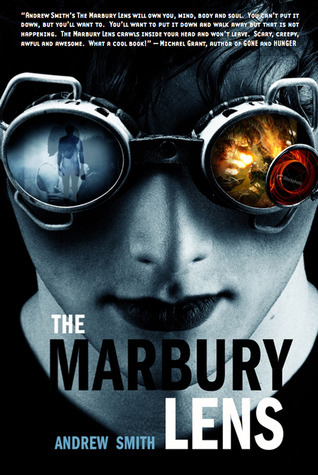 The Marbury Lens is a testament to excellence in young adult literature. It’s one of the best, and most arresting, books I’ve read for this age group. As an adult, I appreciated that Smith didn’t tame his horrific vision of the life and thoughts of a traumatized teen. The dystopia is deeply personal and psychological. This is a book read with lights on, but eyes wide open. It will change you, scare you, and awe you to your core. I couldn’t get the book trailer to download, but you can find it here.